Discovering when and how the words ecstasy and glossolalia entered into the christian doctrine of tongues vocabulary. How glossolalia entered the christian doctrine of tongues vernacular and became the entrenched form of interpretation. The 1800s was the era of a major transition in the interpretation and understanding of the doctrine of tongues. 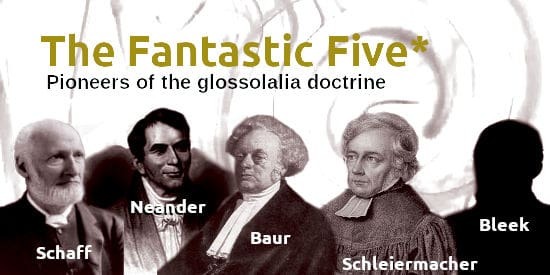 This is a time when the traditional interpretation which consisted of a supernatural spontaneous utterance of a foreign language gave way to enigmatic themes such as ecstatic utterances, prophetic utterance, ecstasy, and glossolalia. This article navigates through this journey of doctrinal change; demonstrating the names, places, and events. An examination on why the traditional interpretations of the miracle of tongues all but died and was replaced by tongues as ecstasy or ecstatic utterance. Online text of Erwin Rohde’s Psyche: The Cult of Souls and the Belief in Immortality among the Greeks, chapter 9. A detailed account of the 19th century Irvingite Church and why they are considered the source of the modern tongues movement. An English translation of the commentary of I Corinthians 13 from the Ambrosiaster text. A technical look at how the phrase unknown tongues entered the English vocabulary.